If you like your film noir with a heaping helping of cold war paranoia, then this week's movie is right up your alley. 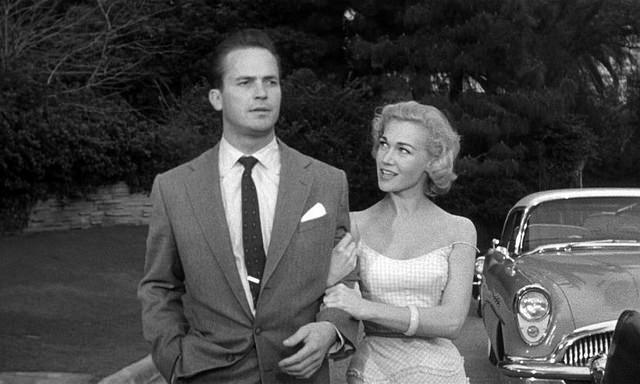 TCM will air Kiss Me Deadly (1955) starring Ralph Meeker and Leigh Snowden (above) at 9:45 p.m. July 10 as part of its film noir festival, Summer of Darkness. A viewer's guide for this classic noir/science fiction mash-up is below. Kiss Me Deadly (1955) is both a masterpiece of film noir and one of the strangest films of the 1950s. It certainly has to be the only movie that combines hard-boiled private detective fiction, the romantic poetry of Christina Rossetti, and a nuclear apocalypse into a film that was embraced by French directors Francois Truffaut and Claude Chabrol. Kiss Me Deadly begins when hard-boiled private detective Mike Hammer (Ralph Meeker) picks up a terrified woman named Christina (Cloris Leachman) who is running down a deserted road at night. Christina escaped from an insane asylum and she claims powerful men are looking for her. After Christina is tortured and killed, Hammer doggedly investigates her death even though a police lieutenant (Wesley Addy) warns him about the dangers of the case. Opening credits: There are a lot of theories about the film's opening credits (clip below), which run backwards while Christina's terrified gasps are heard above the Nat King Cole song, "I'd Rather Have the Blues." Personally, I think it's meant to create an atmosphere of fear and disorientation rather than imply any romantic liaison between Hammer and Christina. On a lighter note, I've always wondered how many fifties moviegoers actually thought they were watching a film called "Deadly Kiss Me." Aldrich's visual style: Kiss Me Deadly features many hallmarks of the noir style like low-key lighting and Dutch tilts, but director Robert Aldrich has a distinctive visual style that's all his own. He uses extreme close-ups to heighten the paranoid atmosphere, and sometimes he ignores the rules of filmmaking by only showing the actors' feet. This serves two purposes: It allowed Aldrich to subvert the production code by suggesting, but not actually showing, violence, and it also builds paranoia and confusion for the audience who cannot read the actors' facial expressions for cues on how to process what is happening onscreen. Hammer: Ralph Meeker is sort of a budget Robert Mitchum, but he's exactly right for Aldrich and screenwriter A.I. Bezzerides' portrayal of Hammer as a small-time thug who's in over his head (although, because it's the 1950s, Hammer wears snazzy suits while administering beat-downs). Hammer is the ultimate bull in the china shop who punches first and asks questions later. By the end of Kiss Me Deadly, Hammer has literally bullied his way into a nuclear apocalypse. The "great whatsit": The first half of Kiss Me Deadly is a standard, albeit stylish, film noir. Then Hammer meets Christina's roommate (Gaby Rodgers), and he finds out from her that Christina had access to the "great whatsit," a mysterious box that turn out to be some type of nuclear device. The movie then takes a sharp turn into science fiction that shouldn't work on paper, but actually makes Kiss Me Deadly so much more compelling than the standard film noir. The "great whatsit" in Mickey Spillane's novel is illegal drugs, but Aldrich and Bezzerides tapped into the fifties zeitgeist of nuclear paranoia. "These things were in the air at the time, and I put them in," Bezzerides said in an interview quoted in the TCM database. "There was a lot of talk about nuclear war at the time, and it was the foremost fear in people's minds." 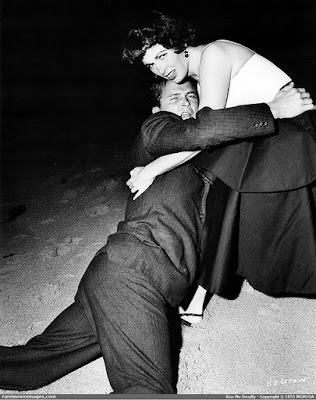 While many fifties movies obliquely mentioned the nuclear threat -- many of the fifties monsters like Godzilla are the result of nuclear radiation -- Kiss Me Deadly dealt directly with many people's fear that nuclear technology would fall in the wrong hands. 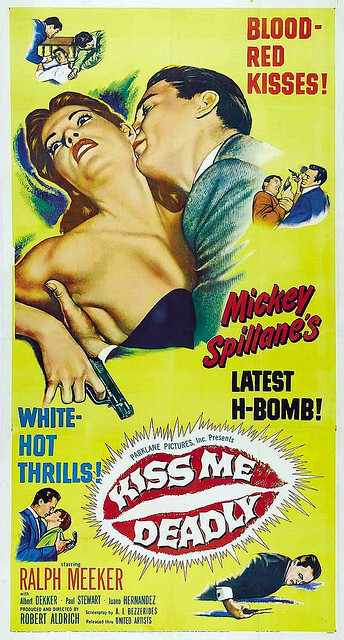 A vintage poster for Kiss Me Deadly (1955). The ending: There are actually two endings for Kiss Me Deadly. In the original ending, both Hammer and his girl Friday/girlfriend Velda (Maxine Cooper) perish in a fiery nuclear explosion. The Catholic League of Decency objected to this ending (among many other things), so United Artists forced Aldrich to re-shoot the ending. This time around, Hammer and Velda escape the blaze. The reception: Most American movie critics greeted Kiss Me Deadly with indifference, but the cinephiles at the influential French magazine Cahiers du Cinema embraced the movie as part of the new cinema. Francois Truffaut called Kiss Me Deadly "the cinema event of 1955," while director Claude Chabrol contrasted Spillane's novel with the film. He wrote, "Robert Aldrich and A.I. Bezzerides have taken this threadbare and lackluster fabric and have splendidly rewoven it into rich patterns." If you missed TCM's airing, you can catch Kiss Me Deadly on DVD. Overall, the movie and I stare at each other with suspicion, but do like the appearance of favourite character actors like Juano Hernandez, Paul Richards, Jack Elam and Jack Lambert. Yea, while I really like it, the portrayal of the female characters is so annoying. Love this film. Director Robert Aldrich has confirmed he filmed only one ending - Velma and Mike escaping into the water. The edited ending ( which Aldrich had no hand in) was on most videos and DVDs for years. Love your idea that some folk thought the film was Deadly Kiss Me!